Russia launched a year-long fake news campaign about Kiev’s and NATO’s plans for the Azov Sea before seizing three Ukrainian ships and their crew there, EU security commissioner Julian King alleged Monday (10 December). King said Russian media, for example, spread false claims that Ukraine had infected the Azov Sea with cholera, and that British and Ukrainian secret services had tried to ship a nuclear bomb to Crimea. 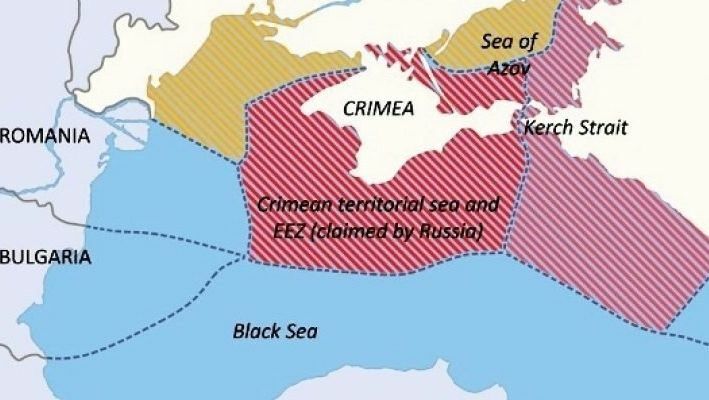 Russia annexed Crimea in 2014, and last month its forces opened fire on three Ukrainian navy vessels and seized them as they tried to pass through the Kerch Strait from the Black Sea to the Sea of Azov. “If any of you thought that that incident, as it were, came out of the blue, you would be wrong,” King told a conference in Brussels organised by the German Marshall Fund think tank. “The disinformation campaign began much earlier, more than a year ago, when Russian media started pushing claims that the authorities in Kyiv were dredging the seabed in the Sea of Azov in preparation for a NATO fleet to take up residence,” the British commissioner said. “Russian media reported that British and Ukrainian secret services have been trying to transport a nuclear bomb to the newly built bridge to occupied Crimea in order to blow it up,” he added. 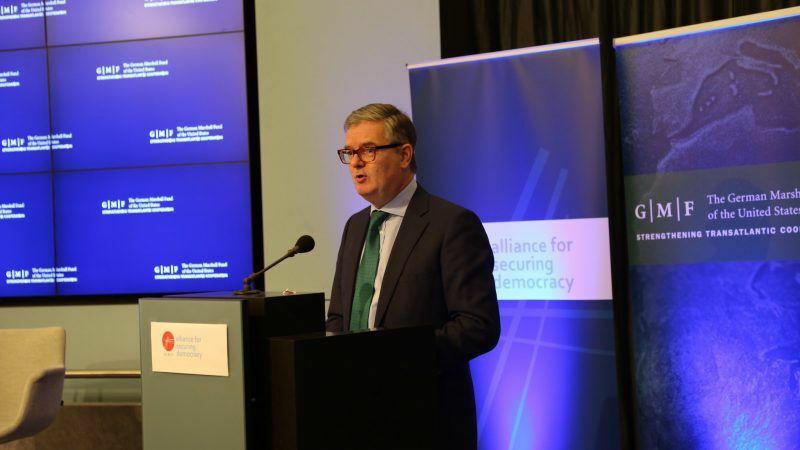 He said the services of the European Commission, the 28-nation bloc’s executive arm, had discovered the campaign as he underlined a new push to bolster such services. 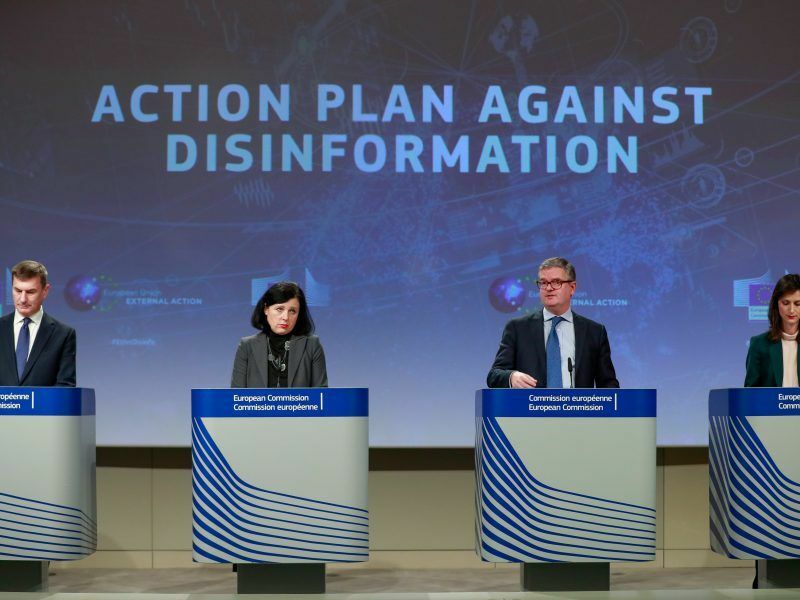 Last week, the EU announced a plan to increase from €1.9 million to five million euros next year the European Commission’s budget to tackle disinformation. At the same time, it launched a bloc-wide alert system and pressured internet giants like Facebook for more help in fighting disinformation. On Monday, Brussels confirmed new sanctions against nine people involved in the elections last month in Russian-backed breakaway eastern Ukraine, which were condemned by Brussels as “illegal and illegitimate”. Those targeted in Ukraine’s Donetsk and Lugansk “People’s Republics” include Leonid Pasechnik, 48, who was elected leader of the Lugansk region. Ukrainian Foreign Minister Pavlo Klimkin attended a meeting of his EU counterparts in Brussels on Monday to update them on the crisis and press them for more help, in particular asking the bloc to bring in new sanctions related to the Azov Sea incident. The EU’s diplomatic chief Federica Mogherini said hosting Klimkin was an important “political gesture” of support for Ukraine. She added that the bloc would look at boosting financial support for Ukrainian regions affected by the restrictions on shipping, but there was no agreement on new sanctions. I follow Russian media quite closely and I haven’t seen any of the claims that mr. King claims to have found. I did find open threats by Ukrainian politicians against the bridge and I did find Ukraine openly bragging about having sent to ships of war through the Kerch Strait without Russia having been informed. I cannot exclude the possibility that mr. King found the assertions he mentions in some obscure Russian magazine. But the fact that he leaves out crucial information tells me that he isn’t a honest man. Of course it may be true that Ukraine indeed is planning a NATO involvement in the Sea of Azov. It is building a navy base there and the first thing that it did after the Kerch Street incident was asking for NATO involvement. Given the prevalence of the cholera bacteria it might well be true that it is present in the Azov Sea. Uncooked sea food can be a contaminant of cholera. However, the cholera bacteria loses much of its harmfulness after it has been outside the human body for some time.